Gill’s farm had the most beautiful swiss chard, which changed up some of my ideas for a side dish to accompany the pork braise. Lisl thought “risotto” so we decided to make a reprise of one of my favorite meals from the summer, chard leaves stuffed with risotto, from the wonderful Mark Bittman blog Bitten. We kept it in line with the Alice Waters theme by working (mostly) off of an asparagus and lemon risotto recipe from The Art of Simple Food, although we swapped out the asparagus for a subtle amount of fennel. We lightened this dish up by removing the mozarella and parmesan cheese you will find in both Bittman and Waters’ recipes, and by reducing the size of each ball of risotto. I made a vegetable broth the day before, which was a simple combination of 2 quarts of water or so, 3 carrots, 3 celery ribs, 1 onion, 3 large cloves of garlic, 2 bay leaves, several sprigs of thyme and a large bunch of parsley — all simmered together for several hours. Bring your stock to a boil in a saucepan and cover, turning off heat. Remove the zest from your lemon, and reserve the juice. Fnely chop up some of the thin fronds from the top of the fennel and save a tablespoon’s worth. Then remove the bottom and any tough outer layers to the fennel bulb and finely chop. Finely chop the onion. Heat up the butter in a heavy-bottomed pan over medium heat and add the onion and fennel. Cook until the onion is translucent, then add the rice. Cook the rice, periodically stirring, for about 4 minutes until the rice turns mostly translucent. Do not let it brown. 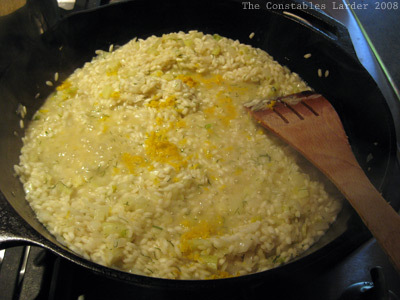 Stir the lemon zest and fennel fronds into the rice, then pour in the wine. Stir almost continuously until wine is absorbed, and then add your stock 1/2 cup at a time, stirring as continuously as you can bear. When the rice starts to thicken, add another 1/2 cup, and do not let the rice dry out. Cook until the rice is tender but not mushy, about 25 to 30 minutes in all. When the rice is almost done, stir in the lemon juice and carefully add salt (the amount will depend on the saltiness of your stock), then remove from heat to cool. 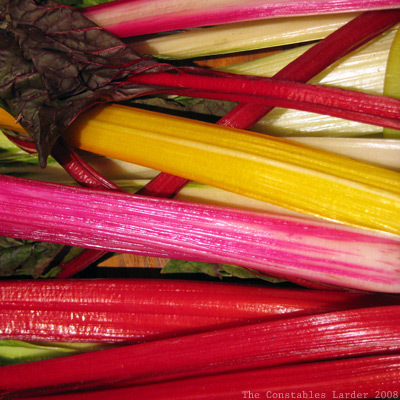 With a sharp knife, remove the stalks running up the center of the chard leaves and discard. Boil a pot of water and parboil the leaves for about 30 seconds, then remove to cool. 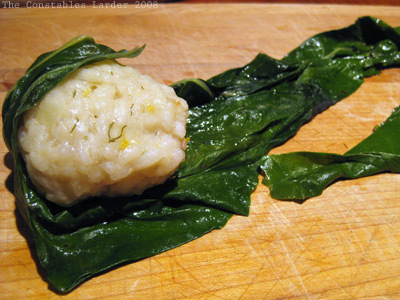 With your hands, make small balls of risotto, about an inch or so in diameter, and tightly wrap each one in a strip of chard leaf. You can also combine two strips if you have smaller leaves — this does not need to be perfect and impeccably wrapped by any means. It’s not a Tiffany’s box. Repeat “country cooking!” to yourself until you decide that taste is more important than impeccably wrapped spheres. 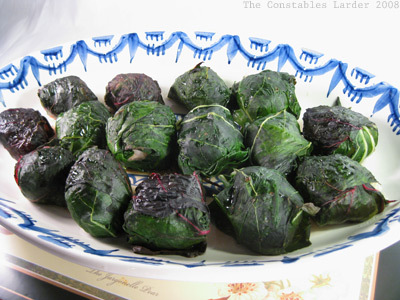 You should have enough risotto and leaves to make over a dozen wrapped balls. Place closely together in a baking dish and pour the broth over top. Bake for 10 minutes at 400, then reduce the heat to 350 and bake for 10 more minutes. Plate on a serving dish, and dribble some of the broth from the hot baking dish over top. wow, those look so delicious. What a fun idea. I can just imagine what a delight it would be to bite in to that creamy and delicious looking risotto! this is a brilliant creation. beautiful concept and presentation. thank you bee 🙂 Of course I can’t really take any credit for it at all, but I have sure enjoyed making it.